The Global Volcanism Program has no activity reports for Torfajökull. The Global Volcanism Program has no Weekly Reports available for Torfajökull. The Global Volcanism Program has no Bulletin Reports available for Torfajökull. The Torfajökull central volcano, located north of Myrdalsjökull and south of Thorisvatn lake, is cut by a 12-km-wide caldera that formed during the Pleistocene. Torjajökull consists of the largest area of silicic and intermediate volcanism in Iceland; about 225 km3 of silicic extrusive rocks are exposed. The dominantly rhyolitic complex rises about 500 m above surrounding basaltic plains and is elongated in a WNW-ESE direction. Most rhyolitic lava flows were erupted subglacially, forming silicic hyaloclastites that form ridge and dome-shaped breccias. During postglacial times only a narrow fissure zone at the western end has been active, producing mostly silicic lava flows, lava domes, and tephras. The most recent silicic eruption produced the Hrafntinnuhraun lava flow about 900 CE. The fissure system is along trend with and was active at the same time as the basaltic Veidivötn fissure system of Bárdarbunga central volcano in 1477 CE. 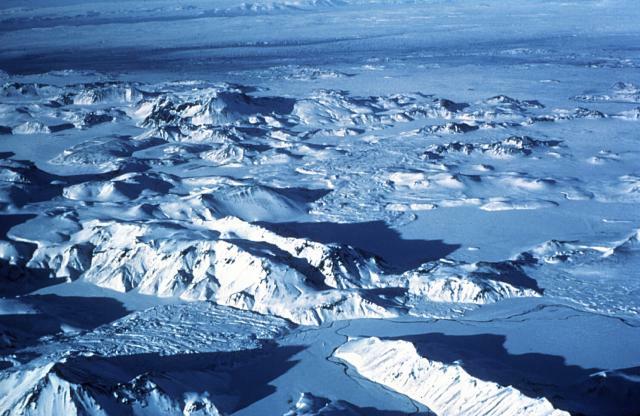 The small Torfajökull icecap lies mostly outside the SE rim of the caldera, which is the site of vigorous thermal activity over a broad area of 130-140 km2. Gunnarsson B, Marsh B D, Taylor H P Jr, 1998. Generation of Icelandic rhyolites: silicic lavas from the Torfajokull central volcano. J. Volcanol. Geotherm. Res., 83: 1-45. MacDonald R, McGarvie D W, Pinkerton H, Smith R L, Palacz Z A, 1990. Petrogenetic evolution of the Torfajokull Volcanic Complex, Iceland I. Relationship between the magma types. J Petr, 31: 429-459. McGarvie D M, MacDonald R, Pinkerton H, Smith R L, 1990. Petrogenetic evolution of the Torfajokull Volcanic Complex, Iceland II. The role of magma mixing. J Petr, 31: 461-481. McGarvie D W, Burgess R, Tindle A G, Tuffen H, Stevenson J A, 2006. Pleistocene rhyolitic volcanism at Torfajokull, Iceland: eruption ages, glaciovolcanism, and geochemical evolution. Jokull, 56: 57-75. Saemundsson K, 1972. Notes on the geology of the Torfajokull central volcano. Natturufraedingurinn, 42: 81-89 (in Icelandic with English summary). Saemundsson K, 1988. The geology of the Torfajokull region. Arbok Ferdafelags Islands 1988, p 164-180. Tuffen H, Gilbert J, McGarvie D, 2001. Products of an effusive subglacial rhyolite eruption: Blahnukur, Torfajokull, Iceland. Bull Volcanol, 63: 179-190. Wilson L, Fagents S A, Robshaw L E, Scott E D, 2007. Vent geometry and eruptions conditions of the mixed rhyolite-basalt Namshraun lava flow, Iceland. J. Volcanol. Geotherm. Res., 164: 127-141. InSAR images of Torfajokull caldera generated from SAR images acquired over the caldera from (a) 1993 to 2000 and (b) 2003 to 2007. In both cases the satellites were flying in a descending orbit, and the line-of-sight vector is to the ESE, ?21? from the vertical for (a) and ?23? for (b). 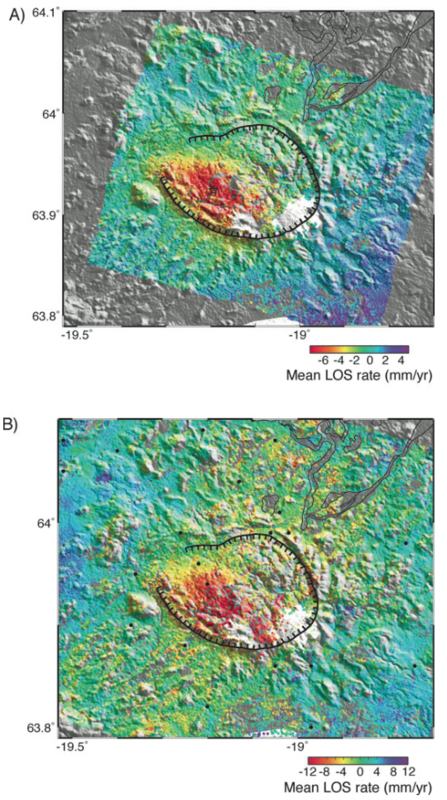 Line-of-sight lengthening is seen in the western part of the volcano, and assuming that this motion is predominantly vertical gives subsidence rates of up to ?8 and ?13 mm yr?1, respectively. Black outlined star is the location of the centre of subsidence. Note difference in scale between (a) and (b). From: Scheiber-Enslin et al. 2011. Reference List: Scheiber-Enslin et al. 2011. Scheiber-Enslin, S. E., LaFemina, P. C., Sturkell, E., Hooper, A. J., & Webb, S. J., 2011. Geodetic investigation of plate spreading along a propagating ridge: the Eastern Volcanic Zone, Iceland. Geophysical Journal International, 187(3), 1175-1194. There is no Emissions History data available for Torfajökull. 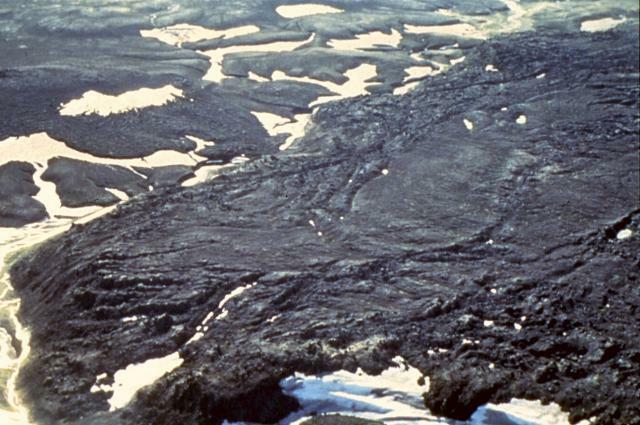 The viscous Laugahraun lava flow was emplaced in 1477 just inside the northern rim of Torfajökull caldera. 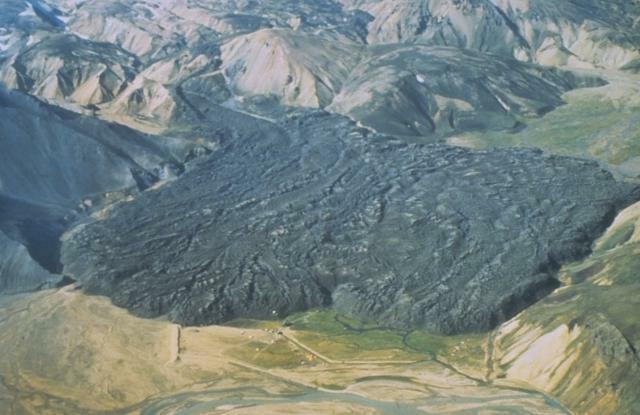 Minor amounts of silicic tephra and lava were erupted from Torfajökull at the southern end of the Veidivotn fissure, which produced a major basaltic explosive eruption in March 1477. Three silicic lava flows--north and south Namshraun and Laugahraun--were emplaced near the northern margin of the Torfajökull caldera. The silicic Hrafntinnuhraun lava flow and tephra were erupted about 870 CE at the SW end of a fissure system that also produced basaltic eruptions from the Vatnaoldur fissure of Bardarbunga volcano at this same time. The Hrafntinnuhraun crater row was the source of the roughly 870 CE "Settlement Layer" tephra that forms a prominent time marker throughout SW Iceland. The Torfajökull central volcano is cut by a 12-km-wide caldera that formed during the Pleistocene. Torfajökull is of one of the largest areas of silicic and intermediate volcanism in Iceland. The Laugahraun (lower left) and Domadalshraun (right center) lava flows, seen here from the SE, are located just within and north of, respectively, the northern caldera rim. During postglacial times only a narrow fissure zone at the western end of Torfajökull has been active, producing mostly silicic lava flows, lava domes, and tephras. The Global Volcanism Program has no maps available for Torfajökull. Catalogue of Icelandic Volcanoes (Link to Torfajökull) The Catalogue of Icelandic Volcanoes is an interactive, web-based tool, containing information on volcanic systems that belong to the active volcanic zones of Iceland. It is a collaboration of the Icelandic Meteorological Office (the state volcano observatory), the Institute of Earth Sciences at the University of Iceland, and the Civil Protection Department of the National Commissioner of the Iceland Police, with contributions from a large number of specialists in Iceland and elsewhere. This official publication is intended to serve as an accurate and up-to-date source of information about active volcanoes in Iceland and their characteristics. The Catalogue forms a part of an integrated volcanic risk assessment project in Iceland GOSVÁ (commenced in 2012), as well as being part of the effort of FUTUREVOLC (2012-2016) on establishing an Icelandic volcano supersite. Large Eruptions of Torfajökull Information about large Quaternary eruptions (VEI >= 4) is cataloged in the Large Magnitude Explosive Volcanic Eruptions (LaMEVE) database of the Volcano Global Risk Identification and Analysis Project (VOGRIPA).